The new chief of also-ran cable news network MSNBC, Rick Kaplan, brings with him two decades of broadcast news experience at ABC and, more recently, three years of cable news work at CNN. But the first point Kaplan made after being appointed to the beleaguered network last week was that he didn't plan any quick fixes. Although his prime-time talk show lineup -- Chris Matthews, Keith Olbermann, Deborah Norville and Joe Scarborough -- places a distant third behind CNN and top-ranked Fox News, Kaplan said it should have time to grow. The brightest light on Kaplan's roster is Matthews' Hardball. This rough-and-tumble political chatfest is increasingly must-see TV for a small (443,000) but driven number of viewers whose thirst for politics extends far beyond what's in the newspapers and on the evening news. Lately, with Democratic primaries at the top of the national agenda, Hardball has been making inroads against CNN's young contender Anderson Cooper (455,000) in a battle for second place in 7 p.m. ET/4 PT cable news -- though both are far behind the king at that hour, Fox's Shepard Smith, who draws 1.3 million. In Matthews, a former top aide to the late House Speaker Tip O'Neill, political junkies have a kindred soul. Matthews, who also hosts a successful syndicated weekend public affairs show, lives and breathes politics. 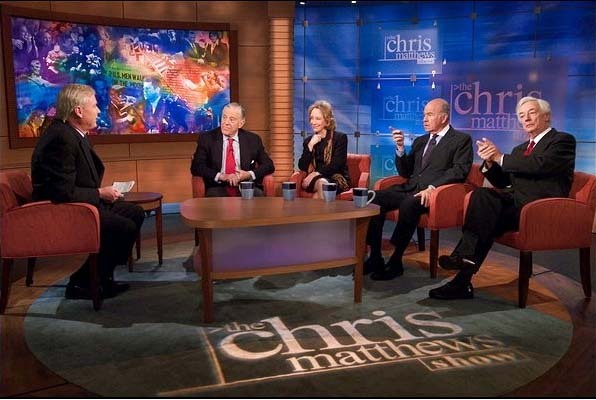 Matthews, no shrinking violet in the ego department, does credit his regular ensemble guests -- MSNBC political talkers Pat Buchanan and Scarborough, Ron Reagan and former Dean campaign manager Joe Trippi -- with making Hardball stronger of late.